Most commonly used Downy Mildew protectant fungicides, like copper and mancozeb can wash off with the first rainfall event, leaving grapevines exposed to infection. With REVUS you can have the confidence of up to 21 days reliable rainfast protection, no matter what the weather. SAVE MONEY Active ingredient works inside the plant tissue rather than sitting on the surface, providing complete rainfastness and eliminating costly reapplications. SAVE TIME Protection lasts for up to 21 days vs only 14 days when using traditional copper. BETTER YIELD Reduced risk of yield loss from Downy Mildew. EXCELLENT IPM PROFILE An excellent IPM profile and soft on bees and other beneficial insects. REVUS has been developed in Australia to protect grapes from Downy Mildew up to and over the critical flowering period. REVUS is applied as inflorescence develop and again 10 to 21 days later. REVUS offers excellent protection from infection, defending against spores from inside and outside the plant. Use the shorter interval during periods of rapid growth or when conditions are more conducive to disease development. Spray intervals of more than 14 days should only be used once significant new growth has ceased. A maximum of 2 consecutive sprays (up to 50% of Downy Mildew applications) of REVUS can be applied during a season In high pressure regions up to 4 applications of REVUS can be applied during the season if REVUS is mixed with another Downy Mildew product. Two consecutive applications of REVUS can be applied which is especially useful when protecting the crop over the critical flowering window. Depending on the disease pressure, an application of RIDOMIL GOLD MZ or RIDOMIL GOLD PLUS can be applied to offer continued protection up to 30 days before harvest. A trial conduct on Shiraz (Syrah) in Yarra Valley, Victoria (2005/06 season) was assessed for Downy Mildew incidence (leaves) 63 days after final application, the treatments are compared in the graph. All treatments applied 3 times at 21 day intervals and at 4X concentrate (232 L/ha), ie at 4X dilute rates expressed in the graph. What is the Mode of Action (MOA) of REVUS? REVUS is a highly effective preventative fungicide that primarily inhibits germination of Downy Mildew, preventing penetration into the plant tissue. REVUS contains the active constituent mandipro-pamid, which is a carboxylic acid amide fungicide. REVUS and dimethomorph (Acrobat*) inhibit the biosynthesis of phospholipids and cell wall deposition. What is the MOA group for REVUS? What is the resistance risk of REVUS? Long-term experience with CAA fungicides (REVUS and Acrobat*) demonstrates that the resistance risk of Plasmopara viticola to this fungicide group is considered to be moderate and can be managed through appropriate use strategies. Should REVUS be tank-mixed with another MOA Downy Mildew protectant fungicide? New resistance management guidelines state that in ‘high pressure regions’ REVUS should be mixed with a protectant fungicide from a different fungicide group. In such high risk areas a maximum of 4 REVUS sprays can be applied in a season so long as they are part of such a tank mix. In other low to medium risk areas a maximum of 2 solo sprays of REVUS can be used, with no more than 2 consecutive REVUS sprays being applied. REVUS should not be the final downy mildew spray for the season and the number of REVUS sprays should comprise no more than 50% of the total number of downy mildew sprays for the season. Why are there two different rates of REVUS on the label? The two rates are on the label to provide growers with the flexibility to choose the protection period that they want to achieve, and also to suit the conditions at the time of application. The 40mL/100L, Dilute application rate is designed for periods where rapid leaf growth is occurring and suits application intervals of 10-14 day intervals as part of a Downy Mildew control program applied prior to a Downy Mildew infection event. 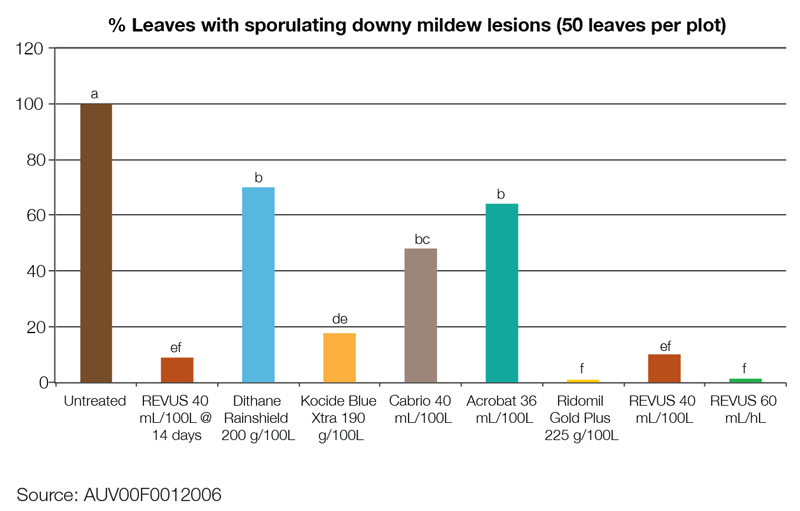 The 60mL/100L, Dilute application rate is designed for periods when conditions are more conducive to Downy Mildew infection and a longer period of control is desired (10-21 day intervals), however, spray intervals of more than 14 days should only be used once significant new growth has ceased. Once dried on the plant, REVUS cannot be washed off the plant (REVUS LOK+FLO™ action) - unlike traditional protectants. REVUS will remain LOK’ed on and FLO in to treated plant tissue to offer control of Downy Mildew, regardless of rainfall. Is REVUS a systemic fungicide? No, REVUS has translaminar movement meaning it will move through treated plant tissue in a direct line from the site of application to the direct opposite side of the treated plant tissue. This offers protection on the underside of the leaf or the inside of the developing grape berry. Is the new growth that occurs after a REVUS application protected against Downy Mildew? No. There is only one group of fungicide - products which contain phosphorous acid - which will move out of treated leaf through the petiole and into new growth. Fungicides which are labelled as being systemic are generally only either translaminar or xylem mobile, meaning they move in an outwards direction from the point of application. Does capfall reduce the protection offered by REVUS over this growth period? The translaminar movement of REVUS provides effective protection across both plant surfaces, and even under extreme weather conditions or when caps fall off during the flowering period, you can be reassured that REVUS will move through the cap to protect the berry underneath the cap even after the cap has fallen off. How compatible is REVUS with other products? REVUS is compatible with the following: THIOVIT JET®, TOPAS®, PROCLAIM®, AGRAL®, SWITCH®, Mimic*, Success*, Avatar*, Delfin Df*, Dithane Rainshield*, Kocide Blue Xtra*, Legend*, Oxydul Df*, Prosper*, Scala*, Teldor*. Do you need to add an adjuvant with REVUS? REVUS does not require the addition of a nonionic surfactant. However, where necessary for other compatible products, a non ionic surfactant may be used. I would recommend REVUS because it's so easy to use. REVUS mixes well in tanks, with no residue left in the tanks after the tank is empty so you know all the chemical has gone out. It’s cost-effective, cheaper than other products in the market and you get a better result from it. REVUS requires less spray, which means less fuel and less wear and tear. You save on wages as it requires less people on the tractors. We can get other jobs done in the vineyard saving us lots of money. The Yarra Valley can experience many Downy Mildew infections through the early part of the season, leading into flowering and through flowering, so it’s critical to be on top of it. Typically growers will use two REVUS sprays depending on the Downy Mildew pressure, and will target pre-inflorescence or pre-flowering, and also during flowering. If they target Downy Mildew with REVUS at the right time, they achieve excellent results and are happy that they can walk away and get on with other jobs. REVUS is a really good product that has performed well in our region. We’ve been very happy with its compatibility and it is the best-fit Downy Mildew product for the period over flowering. It’s significant to be able to lock in a period of protection against Downy Mildew at a busy time in the vineyard.